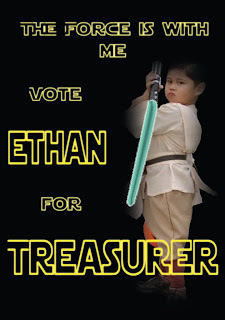 Ethan came home one afternoon after school excited about his running for class treasurer. Coming from a small school, it was no wonder that Ethan did not have a clue regarding class officers, class elections et al. We had to explain to him about the whole thingamajig. It was hilarious how he misconstrued the duties of the treasurer. He initially thought that he could spend the class fund for himself. After another round of explanations he was finally able to "get it". An uncle tweaked the same poster and came up with another Obi Wan Kenobi campaign poster. Below are the two campaign AD posters. The nomination was on a Tuesday. By Wednesday morning 10 of Ethan's tarps were up. I had 24 pieces of one of the designs printed in 3R and asked Ethan to give them away to his classmates. By Wednesday afternoon, his 3R campaign pictures were given out to his classmates and teachers. 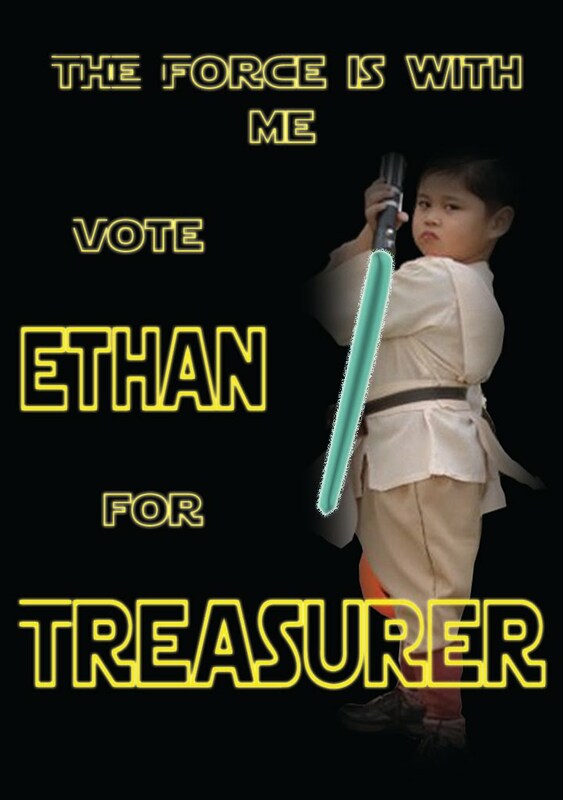 We even campaigned in Facebook so that thousands of our contacts were more than willing to vote for Ethan as class treasurer. Too bad, they're no in Ethan's class. The election was on a Friday. By 2:00 P.M. the results were out! Daughter #2 being the adviser of the student council was able to text us the results of the election. Yes! Ethan won! It was even overheard that his class was seriously considering promoting him as class president for he got the highest vote. Funny! 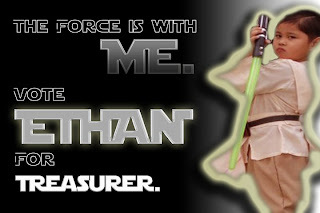 I told Ethan's mom to prepare him for his job as Mufti Day is in the offing. FYI, Mufti Day is when students of SISC come to school in civilian clothes as long as they donate a certain amount to the sponsoring club.